For the first time, oil spill preparedness training was conducted in the icy waters of the Ob Bay. The training scenario included oil spilled from a wrecked tanker shipping in the local Arctic waters, information from the Marine Rescue Service reveal. The Rescue Service, a federal body subordinated the Ministry of Transport, conducted the training in cooperation with Gazprom Neft. It took place at Cape Kamenny, near the place where the oil company is developing its Novy Port terminal. It all proceeded «with excellence», the Marine Rescue Service informs. According PortNews, the exercise is the first ever of its kind in Ob. 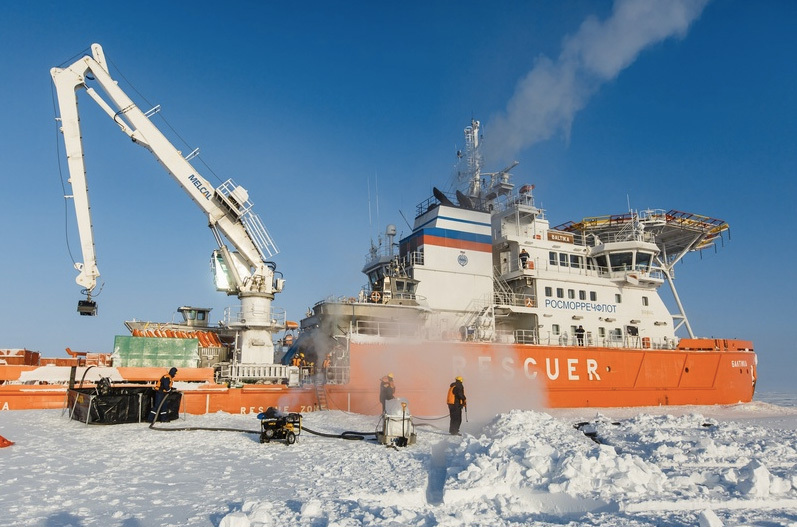 The Gulf of Ob is in winter time covered by thick ice and traffic in the area is dependent on icebreakers. The Novy Port project is Gazprom Neft’s biggest new Arctic oil project. Already this year, the project will deliver two million tons of oil for exports. The shipments will be sent both westwards to EU markets and eastwards along the Northern Sea Route. Part of the project is the laying of a 10,5 km long pipeline from the Yamal coast to an offshore terminal in the Ob Bay. That terminal will be linked with another 105 pipeline stretching towards the Novoportovskoye oil field in the Yamal Peninsula.